The second generation of Apple TV, or Apple TV 2G, has been using the same operating system as iPhone, iPod touch and iPad, iOS, as its firmware OS software. With the release of iOS 4.2.1 for iPhone, iPod touch and iPad, the corresponding new version of iOS for new Apple TV has been released, which is version 4.2. 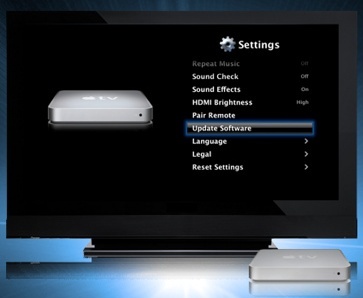 The main feature of iOS 4.2 for Apple TV 2G is the support for AirPlay, a new Apple technology which allows devices running iOS 4.2 and above or Windows PCs and Mac OS X machines with iTunes 10 to stream video, pictures, and music over LAN (Local Area Network) to playback on TVs connected to the Apple TV 2G. The AirPlay also allows users to control Apple TV from the iOS devices. To upgrade Apple TV to latest iOS version 4.2, just go to “Settings” and select “Update Software”.